The premium quality of every dahl valve and pipe hanging product is a promise we make, and a promise we keep, to all of our customers. Quality products and quality service are our only priority. dahl quality is evident in the weight of our products. In many cases, the weight of our product is double that of others, so just by holding it in your hand, you can sense that Dahl Valve Limited products are superior. In the plumbing industry, sourcing of raw materials, parts, packaging and/or finished goods offshore is commonplace. dahl products are designed, engineered and manufactured in our Canadian facilities. We source our raw materials and components from the United States or Canada. This gives us control over product quality and on-time delivery to customers. In order to warranty our products for a lifetime, quality is inherent. 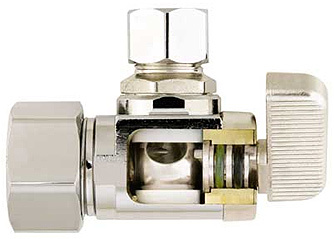 dahl valves are guaranteed for as long as you own the property in which they were installed. Our products exceed CSA and IAPMO requirements. 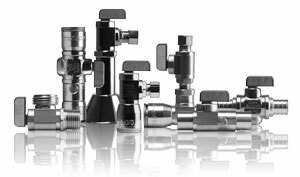 dahl pioneered the 1/4-turn mini-ball™ valve for North American supply stops in 1984.
dahl mini-ball™ valves are available in thousands of configurations. Patented modular design allows for production of a valve for multiple plumbing and hydronic applications. Non-rising stem.. The non-traveling stem stem prevents mineral deposits and other fouling from damaging the seal and causing leaks. Sealing feature. PTFE seals are used to ensure smooth operation and prevent fouling for their lifetime. dahl sets stringent standards for our suppliers. We thoroughly test any material prior to considering purchase. dahl never compromises on quality standards. All raw materials utilized are sourced from the United States or Canada. Brass. Compared to “offshore” brass, American brass has fewer impurities and a preferable microstructure. This results in far superior corrosion resistance in aggressive water conditions. PTFE. The quality of American PTFE rod Dahl Valve Limited purchases for precision-machined ball valve seals is unmatched, and critical to long product life. dahl mini-ball™ valves have been life cycle tested to over 700,000 cycles without failure. O-Rings. dahl only purchases American O-rings made from the highest quality compounds. O-rings used by dahl are free from common defects such as geometric deficiencies that cause leaks and rapid deterioration caused by inferior resistance to aggressive elements in the water. dahl’s warranty is the industry’s best, and clearly proves the quality of the products. It is the result of over 50 years of manufacturing experience. dahl’s position as the industry leader is demonstrated by the immediate responsiveness of customer service representatives. Your call will be answered within 15 seconds from the time you are connected to the phone system. We also monitor e-mails real-time and strive to respond upon receipt.